On hearing news of Napoleon’s defeat at Waterloo on 18th June 1815 (commemorated in Wilkie’s famous picture of the Chelsea Pensioners reading the Waterloo dispatch, right) locals in the Lake District lit a bonfire on top of Skiddaw and gathered there to celebrate, feasting on patriotic fare such as roast beef and plum pudding. The poet Robert Southey, who was there, said that the effect of such lofty partying “was sublime to a degree which none can imagine but those who witnessed it.” Other places followed suit, with extensive public celebrations, dinners and festivals. In November after a formal peace treaty with France was signed, the whole of London was illuminated. In Nottingham, however, the reaction to news of Napoleon’s defeat was far more muted. A cursory musket salute was completed in the Market Square by the militia but there was no public celebration. Historians have tended to see this as part of the city’s lingering radicalism, touched as it was by the outbreak of Luddism that had begun in 1812 and continued to smoulder in and around the city. However, in a new article for Midland History (see link) Richard Gaunt argues instead that the low-key celebrations in Nottingham were more a reflection of war-weariness than sedition. Nottingham had celebrated previous victories over France, often wildly. After the allied victory at the battle of Leipzig in 1813 an effigy of Napoleon was horse-whipped and shot in the city, before being “tried” before 80 diners and burned. 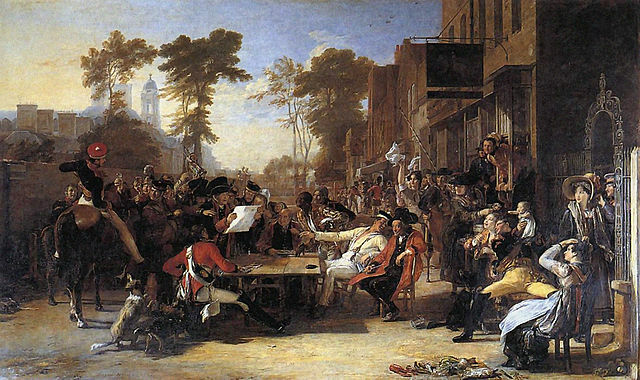 This was followed by extensive celebration of the general peace of April 1814, when Napoleon was exiled to Elba. Bells were rung throughout the city and a huge bonfire set up in the Market Square, along with publicly-funded fireworks. Illuminated scenes of allied victory and concord were exhibited at the Exchange, the work of Richard Bonington Snr (father of artist Richard Parkes Bonington). Similar feasts and festivals were replicated across the county. At Oxton 5,000 fed on roast beef and ale, while at Mansfield Woodhouse every child was given a spiced bun with “peace” stamped on it. In contrast, political complaint had taken place in Nottingham at various points during the wars with France. For instance in 1797, during a period of economic downturn, a 5000-signature petition had urged George III to change his ministers. In 1812 there had been public celebration in Nottingham and Newark after the unpopular Prime Minister Spencer Perceval was assassinated. Nottingham had other reasons for feeling disaffected with Napoleon’s defeat though. After the final defeat of France, widespread expectations of an economic boom were rapidly disappointed amid unsuccessful speculation on the hosiery trade. All this activity did not make Nottinghamshire’s silence over Waterloo a sign of radicalism though, Gaunt argues. The city remained patriotic throughout the wars. Although we celebrated the bicentenary of Waterloo last year, the centenary in 1915 was overshadowed by World War One, and failed to generate much interest. Nottingham, it seems, was almost alone in its indifference to one of the most famous battles in history. Richard Gaunt, “Nottinghamshire and the Great Peace: Reflections on the End of the Napoleonic Wars, 1814-1815”, Midland History 41 (2016), pp. 20-36.